Story-teller Charlotte-Rose de la Force has been banished from the court of Versailles in 1697 following a series of scandalous love affairs. She is sent to the Abbey of Gercy-en-Brie, where she is comforted by an old nun, Sœur Seraphina, who tells her a one hundred year old tale. It is the story of a young girl, Margherita, who is kidnapped and locked in an isolated tower. Margherita is kept hidden for years, but her beautiful singing voice draw the attention of a young man, and eventually she works up the courage to escape. But the story told isn’t only Margherita’s story, it is also the story of her kidnapper, a Venetian courtesan and sorceress, Selena Leonelli. Throughout the storytelling in the Abbey gardens, Charlotte-Rose’s story is also revealed in its similarities and differences. I had thought I could bend the world to my will. I had thought I could break free of society’s narrow grooves, forging a life of my own desire. I had thought I was the navigator of my soul’s journey. I had been wrong. There are many women throughout history who could have uttered the exact words above, but here they are uttered by Charlotte-Rose de la Force. Kate Forsyth manages to capture the feeling of female disempowerment and empowerment at the same time, in an era when to be female was to have little true power. 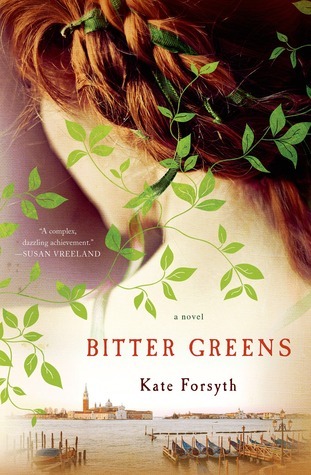 Bitter Greens is three stories in one; those of Charlotte-Rose, Selena, and Margherita. Each of these three characters are strong but have flaws. I believe that’s why it they are so relatable and why I kept turning the page. Even though Margherita’s story is essentially a retelling of Rapunzel, it is written in a way that makes it feel like a new story. It is much darker than the disney version, in keeping with the true history of the times in which the original was written. I loved getting to know more about the sorceress too, and her reasons for locking Margherita up. The research that has gone into this novel makes such an enormous difference; the added details really help bring each of the three women and the settings to life. This is one book where I read the afterword regarding the real Charlotte Rose and through the acknowledgements – normally I skip those. As a side note, look how pretty the cover is. I think it must be one of my all time favourite book covers and captures the content within beautifully. An enjoyable read for those who like historical fiction and fairytales. 4★.